GYPSOIL brand gypsum is similar to other non-pelleted gypsum products. It resembles a powder that feels damp to the touch, similar to slightly-moistened flour or biscuit baking mix. iii It is quite different from most other bulk materials that growers have experience applying. It is very fine and requires some learning on how to handle it. But once you learn a few basic steps, it is not difficult to use. The tips below are based on my eleven years of experience in the gypsum business. I have found solutions for the problems that I and others have encountered in applying almost a million tons. My aim is to help new applicators avoid the common mistakes and be successful immediately. 1. Choose the right fertilizer, lime or litter spreader. For best results, the spreader should have a stainless steel box with slick, steep sides, twin spinners and a wide delivery chain or belt. A delivery chain unloads material from the front of the spreader allowing material to flow freely with less bridging potential than that of a belt. Ideally, sides should slope at a 45-degree angle and the exposed portion of the belt or chain measure at least 20 inches in width. Spreaders commonly used to apply gypsum include BBI, Chandler, New Leader, GVM and Stoltzfus. These spreaders can be ordered with options designed for gypsum application. 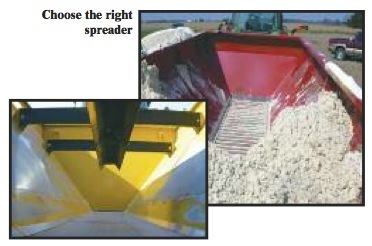 Other brands of spreaders set up in the same way may also be appropriate for applying gypsum. 2. Modify spreaders with painted boxes, interior shields or partitions for gypsum application. Because of its small particle size, gypsum sticks to paint and can bridge on shields, which inhibits flow onto the belt or chain. Plastic liners and treatment with SLIP-Plate graphite film coating promote flow in these situations. Non-essential interior shields, partitions and braces should be removed. 3. 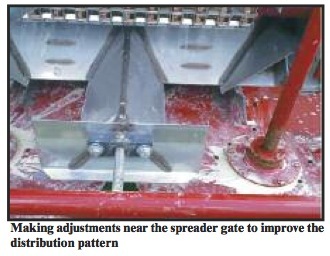 Make adjustments near the spreader gate to improve the distribution pattern. First, remove any unnecessary accessories or equipment from the rear of the spreader. Gypsum should move unrestricted from the belt onto the spinners. Then, adjust the spinner or guide assemblies such that the gypsum drops from the belt and contacts the spinner earlier in its rotation. This will help ensure a more uniform spread pattern in the field. 4. 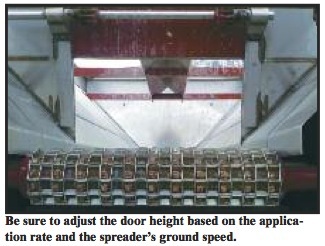 Adjust the door height based on the application rate and the spreader's ground speed. The goal is to have the material flow uniformly onto the spinners. Depending on application rate and belt width, slower application speeds, such as 10 mph or less, require a smaller door opening of 5 to 7 inches. Faster speeds, of 19 to 20 mph, will require a larger door opening of 10 to 12 inches. 5. Store gypsum under cover if possible. Ideally, store gypsum under cover to prevent moisture accumulation. iv If stored outside, choose a site at least 200 feet from the nearest drainage channel. Place the product on clean ground where water drains away. Push the gypsum into a peak to eliminate voids that catch rainfall. As with other farm materials, keep livestock, pets and children away from the pile. Do not pick up debris that may plug the spreader. Feather the gypsum onto the sloped sides of the spreader bed to minimize packing and try to avoid piling against the rear gate. For the first few loads, start small, filling the spreader 1/3 full, gradually increasing the amount until the operator becomes comfortable with the rate, flow and pattern. 7. Allow for small adjustments in equipment and application practices when you begin. Applicators often find techniques that work better for them and their equipment. For example, applicators may need to make adjustments to correctly establish the rate using the spreader's electronic controls. But once set, they should be constant for the machine year in and year out. 8. Apply gypsum any time that it is appropriate to be in the field without physically damaging the soil or the crop. Ideal application periods include before planting, after summer wheat harvest, fall harvest and after any alfalfa cutting once the crop is removed. 9. Apply gypsum in any tillage system. GYPSOIL brand gypsum is water-soluble and moves into the soil profile whether in no-till or tillage situations. Avoid applying on snow-covered or frozen ground to prevent loss to wind and water. 10. Use soil tests to determine gypsum rates. 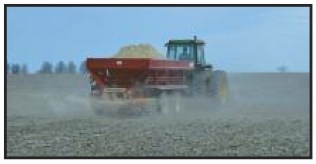 The Cation Exchange Capacity (CEC) levels dictate gypsum rates as a soil amendment. Rates vary from a half a ton per acre on lighter soils to two tons per acre on heavier soils applied every one to two years. If CEC is less than 10, apply 0.5 T/A; if CEC is 10-15, apply 1.0 T/A; and if CEC is greater than 15, apply 2.0 T/A. 11. After several applications, growers may benefit from variable-rate application. For more information on improving soybean productivity with no-till, cover crops and gypsum, go to: www.fabe.osu.edu/usb. Under "websites", click on "Gypsoil library," then "How to apply Gypsoil" to see a video on application tips. Reference to a brand name or company does not imply endorsement by the United Soybean Board.